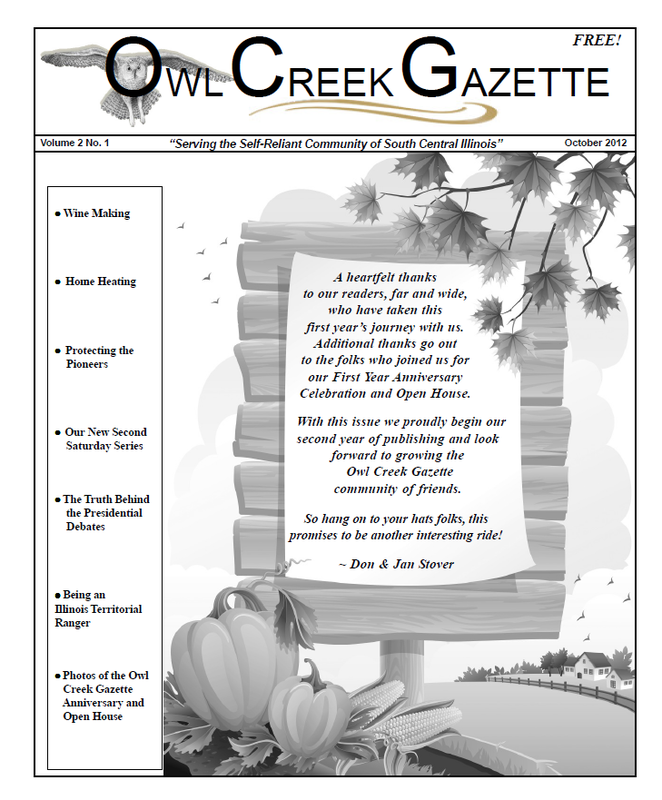 Owl Creek Gazette: HOT OFF THE PRESS! The October issue of the Owl Creek Gazette is hot off the press and can be read via our Current Issue page! It is said that the owl represents wisdom, perception, and truth. Well, the same can be said of the Owl Creek Gazette. Add to that Jan and Don Stover's warm welcome to enjoy a community of people who are putting their heads, hearts, and talents together to make our world a better place... and you have a place to explore the pursuit of happiness. I find the Owl Creek Gazette is good news (make that very good news) worth spreading far and wide. --- In this October issue the Owl brings me the eye-opening article (page 10) about the critical importance of restoring fairness and transparency to the 2012 presidential debate. Thumbs up for the wisdom and commitment of the Owl Creek Gazette to be "a Sponsor of the inclusive 2012 Presidential Debate hosted by Free and Equal Elections Foundation". --- The concept of free and equal is real for this Owl that doesn't sleep. I like that. I'd say that my favorite part of this issue was the light you brought to the Presidential Debates. I had no idea that that third parties were excluded. It's good to understand where the illusion of choice stems from. Thank you for writing about it. Monika ... what a wonderful, almost poetic, way you have of expressing yourself and we are honored to be the subject matter of your commentary. We're extremely grateful for such support and are proud to be a publication people turn to for out-of-the-box information as well as a networking resource for creating and growing a voluntary community of friends and partnerships. Jan, thank you for your kind and encouraging words. I draw a lot of my inspiration and useful knowledge... how to live a life of "love yourself and your neighbor"... from the out-of-the-box-Owl community. Thank you, Jan, and all you wonderful Owls out there!